Holiday party season has just stepped into high gear here in Wellington, and every venue in town is booked out for the rest of the month. My seasonal event schedule is sadly lacking in soirées that call for elegant frocks, but I’ve been doing fantasy event shopping in various museum’s collections, finding dresses that I would DEFINITELY wear had I the occasion, and ones that I want to show you, to see what you think of them. So the next few weeks are going to feature event-worthy (well, maybe) party dresses. Mixed reviews for last week’s dress, with bonus points for some people because the dress looked like a historical superhero costume! I was really intrigued by all the speculation of who it would look good on, and the claims that most women couldn’t carry it off. 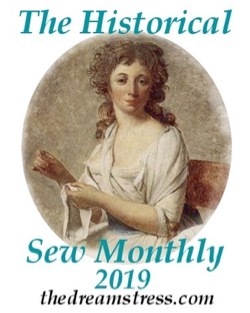 Though it’s not easy to find, the pelisse’s fresh green colour looks really good on me – and is one I think of as very flattering on most women, at least in the historical sense of flattering (tends to make them look pale and mysterious, and the emphasise the contrast between skin and lips). Exactly the same as the week before! To start off my showcase of historical party dresses that a guest could wear to one of those historical extravaganzas I wish I could go to, I’ve chosen a frock from my favourite fashion year: 1916. This dress would definitely benefit from a good steam, and the proper undergarments (a bit more petticoat-age in particular), but the basic essence of the design, and of the impact the dress would have had on the dancefloor, is still obvious. Like many 1910s dresses, this evening gown combines two contrasting design ideas: a bold colour, and delicate layering, with each element of the dress revealing subtle detailing. 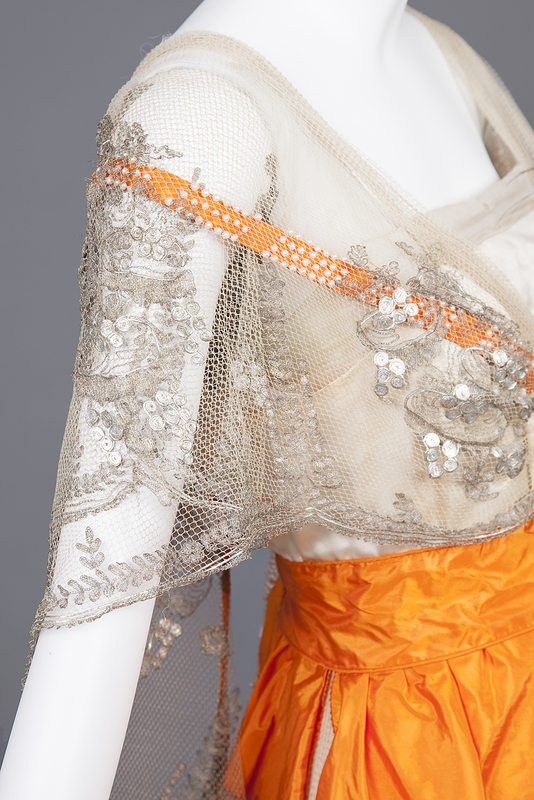 The skirt is made of three layers of net, each embroidered with silvery threads. 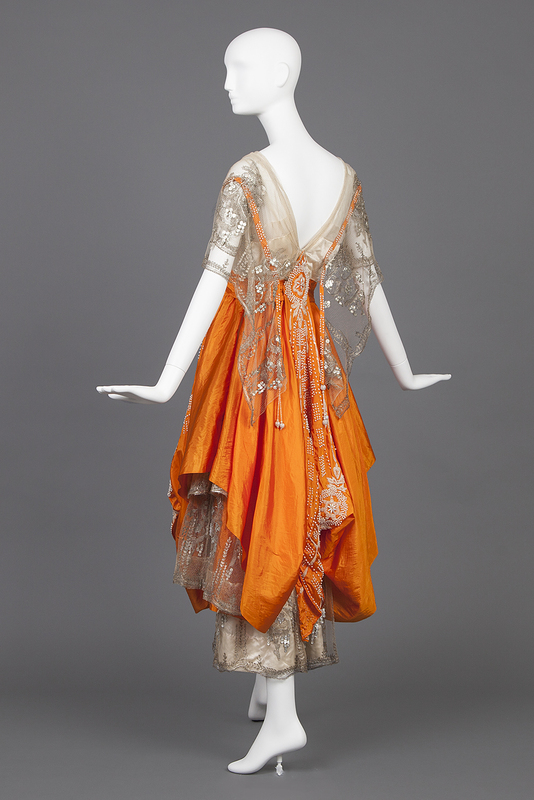 The topmost layer of elaborately worked net is almost completely hidden by the overskirt of vivid orange silk, and would only be revealed as the dress moved and swayed around the wearer. The orange silk, vibrant as it is, is not left alone to speak for itself. 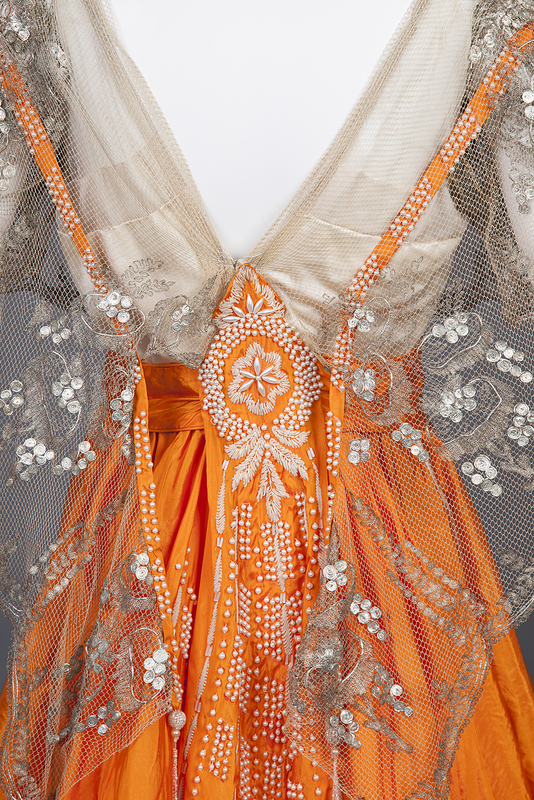 Instead, it features panels of heavy beading, with pearl and glass beads of different sizes, and chenille embroidery, forming forming floral and geometric patterning down the front and back of the dress. 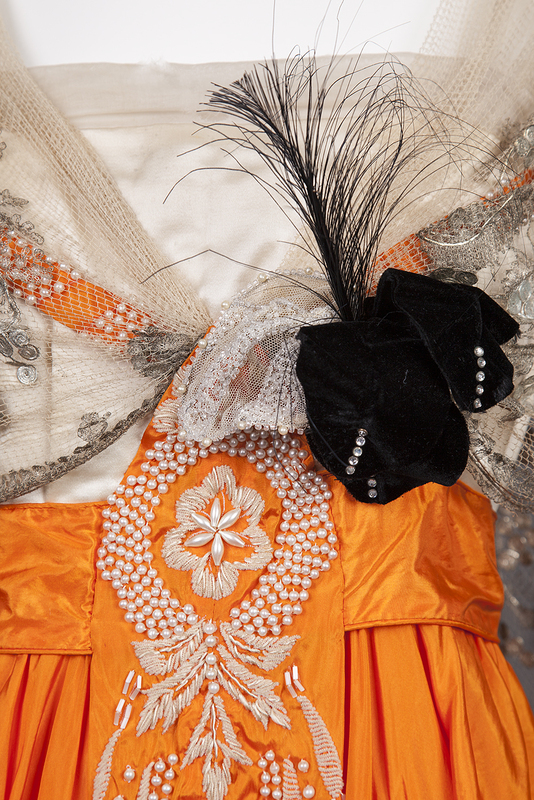 The silver, orange, and white of the dress is offset with a splash of black in the form of a corsage of black velvet and aigrette feathers pinned to the waist. The whole dress is a play on contrasts: muted and vibrant, bold and subtle, delicate and robust, fitted and voluminous. The Goldstein Museum of Design website has some excellent images of the layers of the dress, and how it opens, which I highly recommend checking out if you’re interested in historical dress construction. What a fun holiday dress! I’m in love with the beadwork, and I can imagine (even though it was probably not for Halloween) wearing this to a Halloween gala. Switch out the black bow with a velvet spider and it’s ready to go! Unusual, but lovely. The beading detail and the lace combine to good effect, partly because the beading is not overdone. The black ribbon rosette provides an interesting accent, instead of looking like a mistake. And while I normally would not pair pale lace with such a vivid orange, it seems to work here. I’m not fond of the orange color, I would look as though I had a very bad case of hepatitis if I tried to wear it, but other than that, it’s perfect. I love the detailed embellishments, they’re of high quality and skillful design work. I also would not wear the black pin, unless I was combining the two colors for a Halloween party costume for someone else to wear. I can’t wear orange myself, but this dress would be stunning on the right person. It wouldn’t be nearly as much of a show stopper in another color. You appear to be a “cool” toned brunette. Anyone with a warm skin tones risks looking like the early stages of hepatitis in some greens and yellows and especially greenish-yellows because it enhances the skin’s yellow undertones. Some lighting makes it unexpectedly worse, so many of us reflexively reject anything in that whole range. Hollander was a fashion import and design house. On to the dress and oh my … this concept could so easily have looked like a badly decorated Halloween pumpkin from the hands of GlitterGun Studios but instead it’s delicately deceptively decadent. 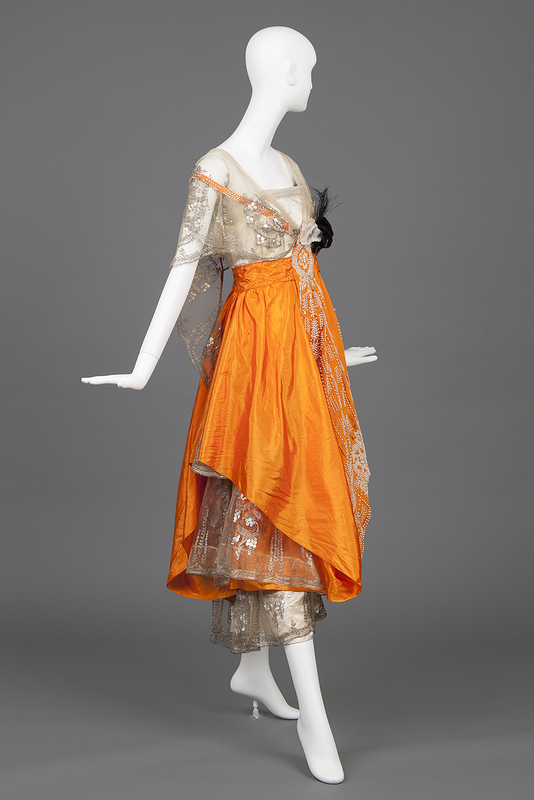 The orange straps appear to be a bodice in danger of falling off, the skirt looks several inches shorter than decency allowed because the orange catches the eye and the sheer lacy layer recedes, and the higher layers flash like petticoats. The lowest skirt would glitter and draw attention to her ankles as she danced. 10/10 for accomplishing its fashion purpose. Actually, I’m a warm dark blond, with red highlights, and very yellow undertones to my skin. 🙂 This shade of green cools them out, and makes me look very ivory – highly desirable from a historical perspective. I love the beading and embroidery. The orange skirt seems to clump in funny ways in spots. All the same, the overall impact is fabulous. 10/10. For the most part, I love this. The first image made me think of a costume from a ballet, and in a good way. The beading and embroidery are exquisite, and the I love how the boldness of the color is tempered by the airiness of the netted elements and decoration. The only niggle for me is the black corsage. I found it too strong a contrast, and my first reaction was that some bird or large moth had landed on it and should be shooed away. Saving the black element, I would wear it in a heartbeat. Wow, I thought this was a show stopper and I rarely like any type of clothing in orange. I love the contrasts in fabric and silhouette and the arrangement of the layers. I also love how the orange is vibrant and beautiful but is located a distance from the face so it would probably look good on a number of different skin tones. I, too, am utterly enamored of 1916 styles (largely thanks to you, Leimomi). This is just stunning, and unexpected, but so, so delicate. That orange is so vivid, even through a computer monitor! 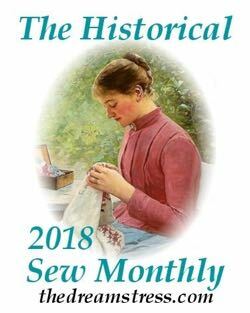 I’d love to see it with some more petticoat fluff and maybe get a better glimpse of that side-business as it moves! This is so Ballet Russe, I can just see it in a dramatically posed black and white photo, al la Scheherazade, I’d love to see it moving. Not just that it sparkles too and I’m a sucker for a bit of sparkle. It’s another 10/10 from me. All the points I would make have already been well covered (I’m always late to the party!) I think this dress is just lovely. My coloring could not handle this shade of orange, but it would be a knock-out on the right woman! It’s seems very theatrical…perhaps too much so for a party dress. 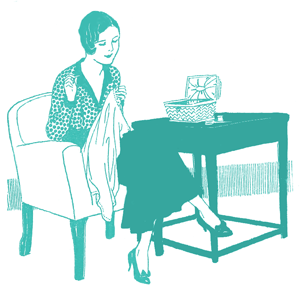 But with steaming and a petticoat, it could be stunning. I never, ever, ever wear orange, but I might make an exception for this dress. I truly love the frothy netting and beads! I’m in love with this dress! The cut, the color, v the beading, the sheer layers… I would not change a thing. And feel certain I could 100% pull it off, it’s the perfect form and a bold but doable color (I shared in a small women’s group and they agreed lol). I may make something inspired by it! What a lovely party frock! I’m not generally a fan of either orange or fashion of the 19teens, but this is delightful. Like others, the only thing I would want to change is the black flowery bit…maybe a deep blue or rich green velvet would still give it that contrast element without the Halloween connotation? If contrast just HAD to be there? I think it would look better without it…9/10. I do like that, looking at the skirt alone, it makes me think of some kind of Eastern/Indian-inspired costume (as in, literal costume, not, “This is what people of that culture actually wear). I’ll also give it points for the time, effort, and skill that must have gone into the beadwork/embroidery, which is another thing I don’t hate. I love it…. no complains. So much detail fotos at the museum, lovely details. Thanks for picking this. I do love a good orange so this is absolutely my thing. The skirt with its layers of lace and silk and the beading is magnificent! The top however I’m not that fond of . It looks almost as if she’s naked under that thin layer of lace. I would really love to see this dress move on the dance floor though! Stunning. 10/10. I love it. I love this dress and would wear it it to a party in a heartbeat. The contrast of the strong colour and delicate beading is marvellous. I didn’t think I’d like the muted tones of the net with the orange, but the more I saw of this dress the more I loved it! I especially like that I can’t work out how it all fits together, it’s like the best kind of puzzle. 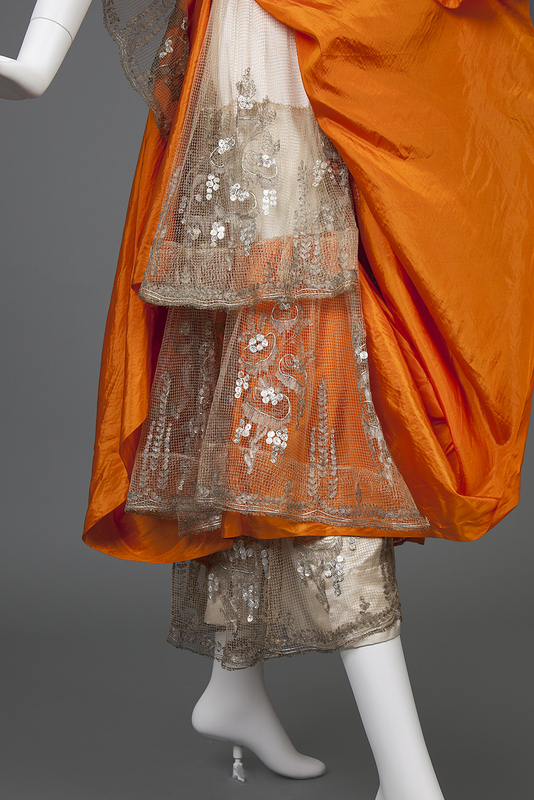 I love this frenzy of overdone lace and pearls and fluttery fairy wings down the back and squashy orangeness. On one hand, there’s just so much; on the other, I just love all of it. So much complicated pearl beading. Such bright, citrussy orange. Such silvery gossamer peeking out of everywhere. If there’s one point where I’m like, “No, let’s have a little decorum and subtlety”, it’s the black feather corsage. But it’s very of the time, and if I have to take the black corsage for the rest of the dress, then fine. Give this overbright, overlayered, overeverything dress a perfect score and let it be on its way. Very clever skirt – think how much fun it’d be to dance in, with those beads! 9/10, one point taken off for slightly too much going on. Such a stunning dress! 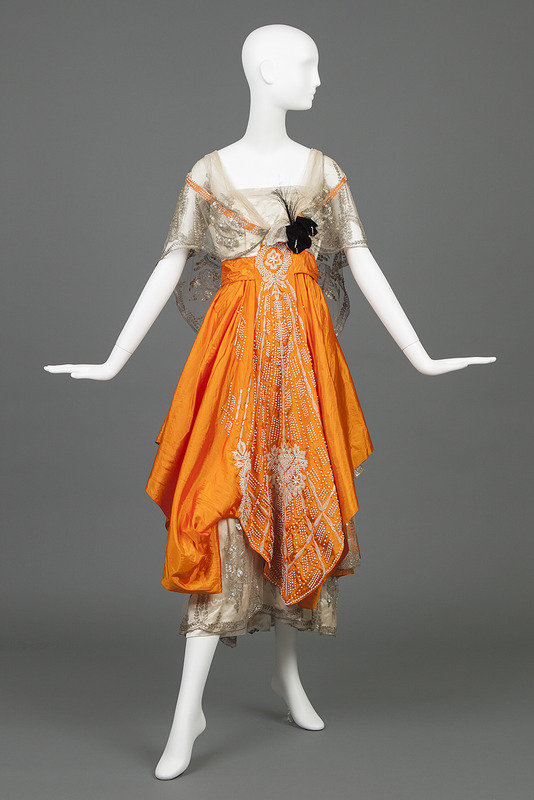 I love the silhouettes of the 1910s, and the contrast of the vibrant orange and the delicate lace and is perfect. I love this dress, from the vibrant contrasts to the silhouette, and the beading!!!! Oh the beading and embroidery is just stunning, sublet and showy at the same time!!! I can imagine it with other colours too, which might help for some who feel orange to be a tricky colour..
It’s a joyful butterfly, about to take flight. But the black corsage seems uninspired, and less special, compared to every other well thought out detail. The three tiers of netting are a wonderful cloud. The beading is elegant. We see many dresses on Rate The Dress that are faded from time, so this is a wonderful pop of color. 10/10 This is gorgeous! 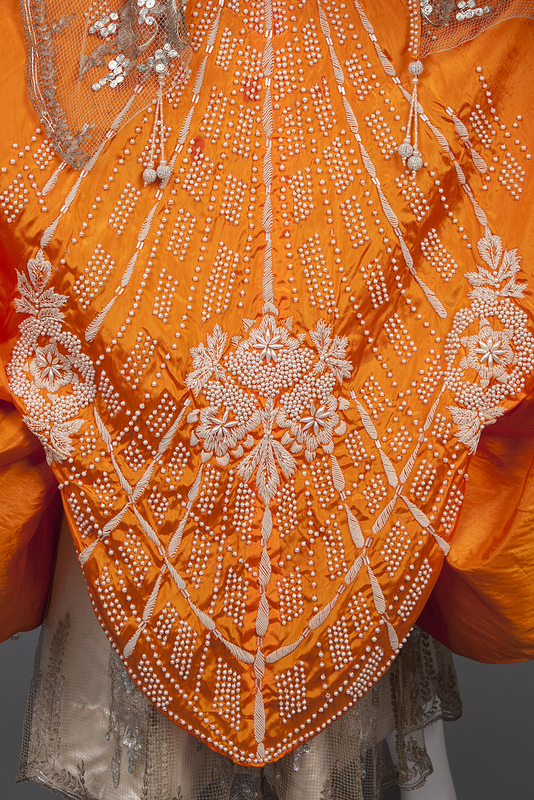 I love the contrast of the vibrant orange with the delicate ivory lace especially once combined with the pearls and silver embroidery. Dresses from this period are such a gorgeous example of fashion as it transitions from one period to another. I like it. It’s weird and delightful! Individually there are a lot of bits I don’t particularly like, but all together it works and is quite fun. Perfect for dancing at a glittery 1910’s party! The one thing I’m not so sure about is how the edges of the orange layer are bunched up underneath on some parts. Just chiming in to ditto the swooning. The top is a little too suggestively see through (possibly it would look less so on anyone with more color than the mannequin), but otherwise I love the drama! It seems to strike a balance between busy and elegant, bold and demur. And yes, I am biased towards orange, so that helps a bit too. I would wear this in a heartbeat. Such a beautiful thing! I wish it was mine. Loved it at first sight but when I saw the close up of the beading, oh my lord! My question is about how color/skin combinations have changed over time. Are there any guides? I am so interested! If I could give this a 100/10 I would! It’s the first time I’ve seen that particular mid-19teens voluminous skirt done in a way I can actually love. Since my initial rating is an improper fraction, let’s stick with 10/10! I have child’s love for bright colors and sparkles. 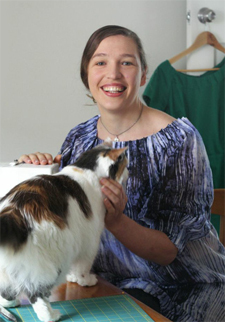 This dress has that but is also really sophisticated and glamourous. I really, really love it. The only quibble I have is is I wish the embroidered netting was a finer mesh. As is it makes me think of mosquito netting. Couldn’t they have used a fine English bobbinet instead? Still, I would appear in this haute couture mosquito netting in a heartbeat. Also, silver and orange? Who would’ve thought those two colors could get along?